Erwin M. Ballarta began his law enforcement career with the Big Spring Police Department in 1982. He moved up the ranks as a Patrol Sergeant, Narcotics Sergeant, and Criminal Investigator Sergeant. In 1987, he accepted a position as a recruit with the Texas Department of Public Safety and after graduation, he found duties in Highway Patrol, Safety Education, Governor's Protection Detail, and Training Academy. Before retirement in August 2008, he attained the rank of Lieutenant coordinating the In-Service Program, Defensive Tactics Program, and the Specialized School Program of the Texas Police Association. Since retirement from Law Enforcement, he has been Senior Vice President of CCNG Inc. and CEO of Armatek USA Security Group Inc. He had instructed both the United States Army and Marines on pre-deployment training. He was recognized by Major General Box for instructing the Governor's Office of Homeland Security Infrastructure Security Teams. He served as a Committee Chair Person for developing the Texas Department of Public Safety's cultural diversity program, entitled "Valuing Relationships." The program focused on developing and teaching values, ethics, communication, conflict resolution, and leadership. In 2001, he received the Wallace Beasley Association of Texas Law Enforcement Educator of the year award. He received the "Texas Professional Achievement Award" from the Texas Commission on Law Enforcement Officers Standards and Education for his contribution to Law Enforcement in the field of training. 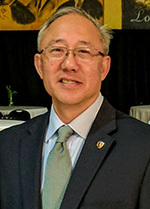 On November of 2001, he acted as Liaison between Phillippine President Gloria Macapagal Arroyo and President George W. Bush on mutual alliance to combat world terrorism in Washington, D.C.
Erwin M. Ballarta is a graduate of Eastern Michigan University and the 188th Session of the FBI National Academy.